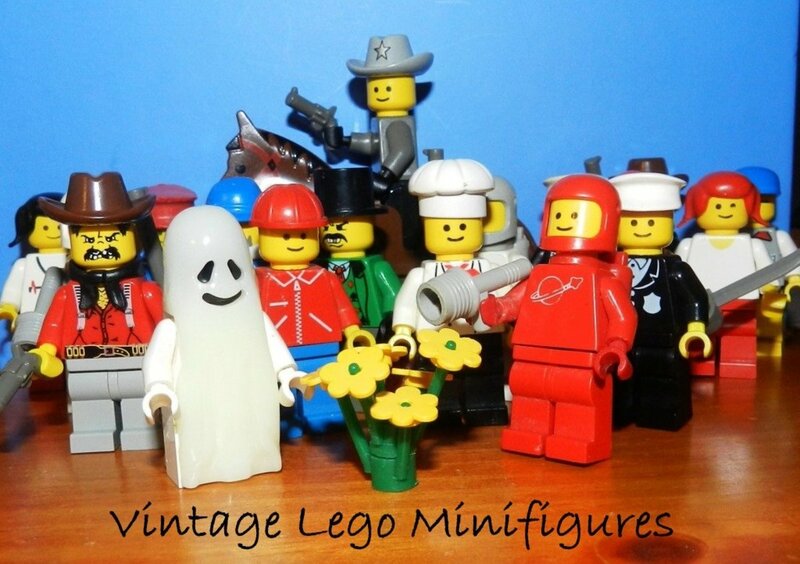 Lego minifigures come in hundreds of shapes and sizes these days, but the vintage minifigs from the classic sets are still cool and memorable. With links to big-name franchises like Batman, Indiana Jones and Lord of the Rings, Lego now has had permission to create some of the niftiest minifigs in its history. 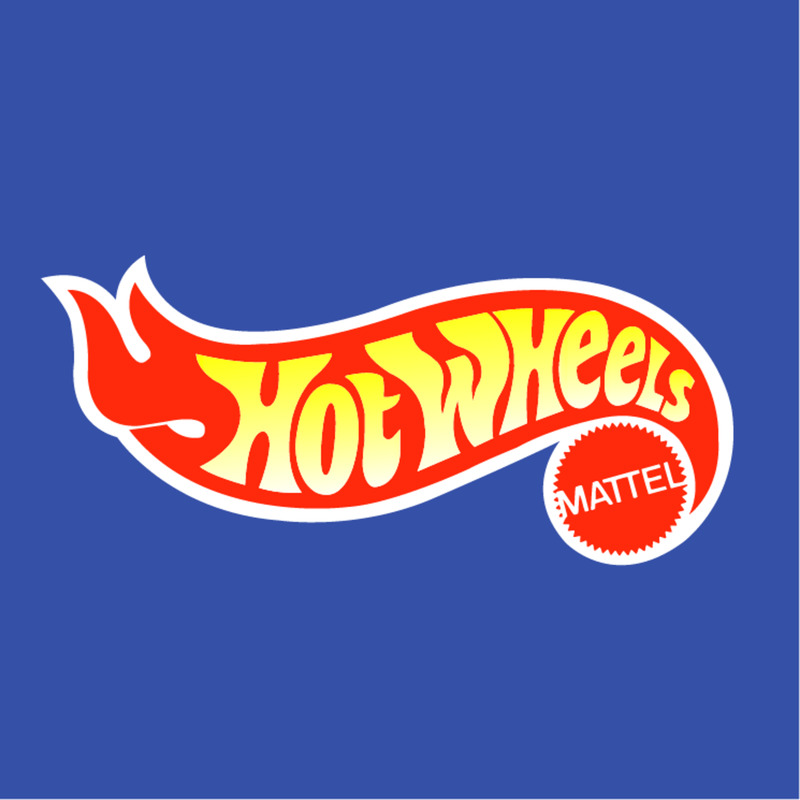 Some people forget that back in the late 1970s it all began with a few themed sets and some very generic-looking characters. But those of us who were around back then remember the fun of those early sets, and the neat little minifigures that came with them. They may not have been as fancy as the figures that would come later, but they were charming and memorable in their own ways. Modern sets may be cooler in the eyes of kids these days, but we kids of the past remember the vintage minifigures that started it all. This article is a tribute to some of those early figures, along with some information on starting your own Lego minifigure collection. The first Lego minifigures appeared in 1975, but they didn't look a whole lot like the ones we know today. They had no movable arms or legs, and some didn't even have faces. They were essentially shaped bricks and required a whole lot of imagination. It wasn't until 1978 that Lego began to produce the articulated little figures that have become so popular. The three major Lego themes at the time were Town, Castle and Space. 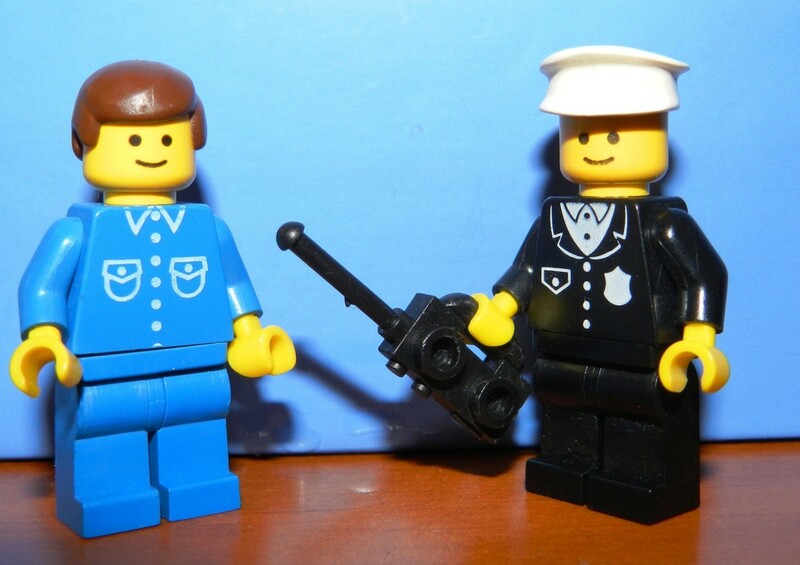 The first real minifigures were firemen, police officers, astronauts, knights, construction workers, and some were just regular people. They each had the same yellow head with a generic smiley face, and the same torso and legs in different colors and designs to reflect the character. Of course they came with neat accessories like swords, walkie-talkies, tools, hats, helmets and backpacks. They may have been simple, but they took the average Lego set from a simple building project to something you could play with indefinitely. Because of their interchangeable parts they provided almost endless creative possibilities. Here's a look at a few of the coolest minifigures from the first 15 years or so. Both of the figures above were released in 1980, and included in the Main Street (6390) building set. The Main Street set consisted of two buildings, one of them under construction. There was a crane with a working winch, a dump truck, a car, and a park bench with some trees and flowers around it. The other minifigures that came with the set were a man in a cowboy hat, a lady, a policeman and another construction worker. 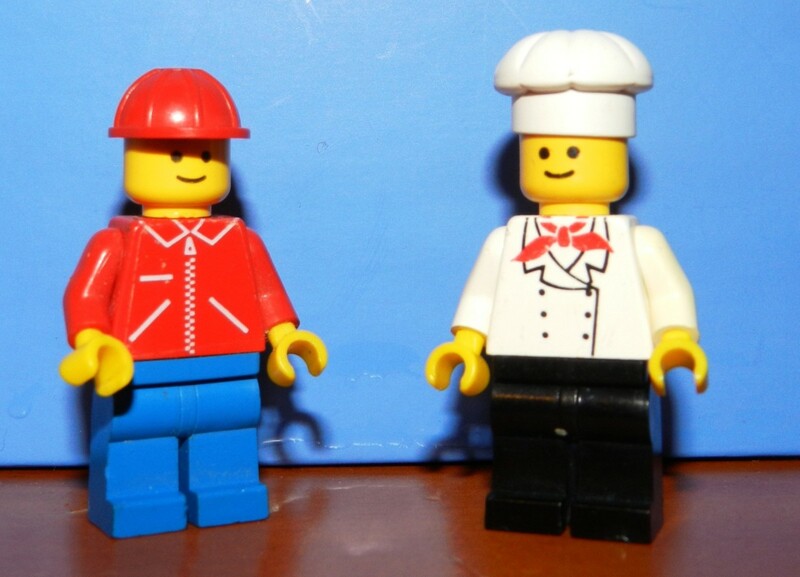 There have been several renditions of the chef minifigure over the years, but this one was the first. Later chefs featured much-improved details and accessories. Interestingly, this chef was in charge of a popcorn stand on the side of the street. Must have been some fancy popcorn! Main Street was part of the Lego Town theme, which included several different types of buildings and utilities. The Police Station (381) was another of the Lego Town buildings, this one released in 1979. The set included three police officers as well as the guy in the blue seen above. In the picture on the box he's depicted flagging in the helicopter on the roof, but he appears to be a civilian so it's anyone's guess as to his job or identity. The set included instructions for building the police center, plus a helicopter, a police motorcycle and a squad car. There were really no bad guys in Legoland until later years (except for ones you invented yourself), but apparently the police were necessary for some reason or another. Maybe they wrote a lot of parking tickets. The fire department, ambulance and other emergency personnel rounded out the list of first-responders should a citizen accidentally drop a 2x4 brick on themselves. The cops too underwent many changes in the years that followed, and today's Lego police force features much improved accessories and detail. 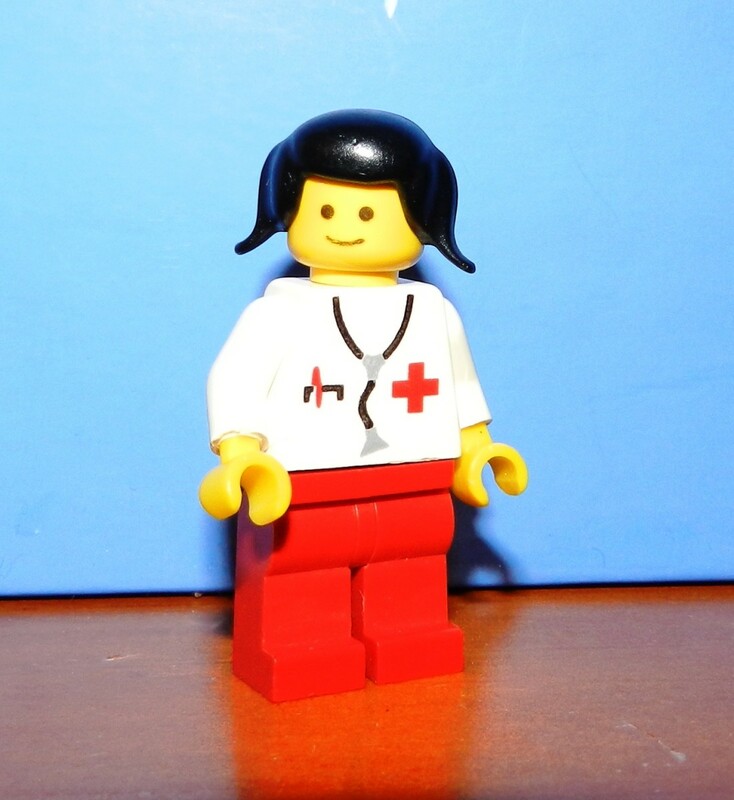 Medical personnel played a key role in Lego society. With all the building going on people were bound to get hurt. This minifigure came with the Paramedic Unit (6364) set from 1980. There was the doctor, her doctor's office, her emergency response vehicle and some miscellaneous guy who was possibly a patient. This was a small set compared to many others, but the cool thing about the early Lego sets was that they each came with a road tile that could be interconnected with other sets, making a town. This might also explain why sets like this came with random figures aside from the necessary doctor. Towns need citizens milling about or else all of these professional people have nothing to do! While Lego citizens were concerned with safety and security around town, they also had an eye for progress. The Lego space program sent intrepid voyagers into the cosmos with little more than a visorless helmet, a jetpack and an ambiguous tool that may have been a weapon but more often than not was depicted as some kind of torch or signaling device. 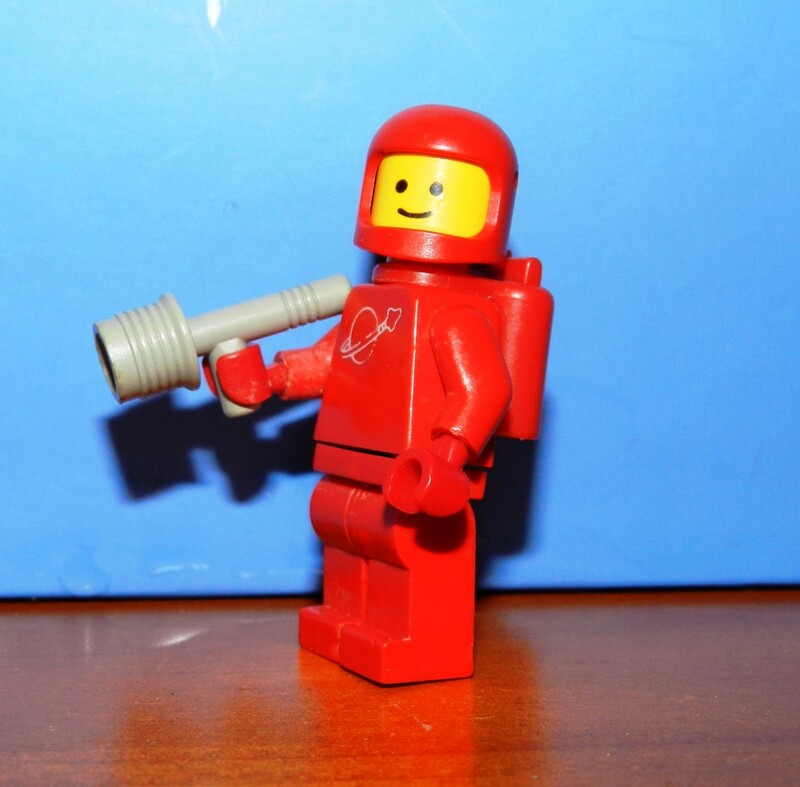 The classic red spaceman above (pictured with said tool) came with the Galaxy Explorer (497) set released in 1979. This was by far the coolest of the early Lego space vehicles. It had a cockpit where several spacemen could pilot the craft, and a docking port in the rear where a small rover could be stored. The set came with two red and two white space guys. The same spacemen were manufactured in other colors such as blue, black and gold in later years. 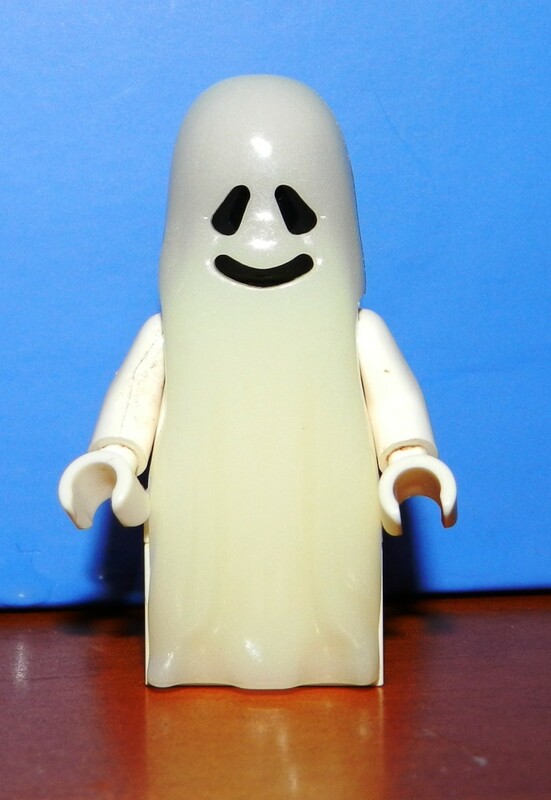 There have been many ghosts and variations of the ghost minifigure through the years, but the one you see here was the first. It came with a tiny set called The Black Monarch's Ghost (6034) which was released in 1990. The set also included a knight and instructions for building a small castle or holdfast of some kind where the ghost could hide. The Castle theme had been big with Lego going back to the late '70s and early '80s. Back then the horses were made from Lego bricks, but not long after they started to produce horse figures. This small set was part of a much greater kingdom of knight sets. Oh, and the ghost glows in the dark. Cool! The desperadoes pictured above are Flatfoot Thompson, Dewey Cheatum and Black Bart. 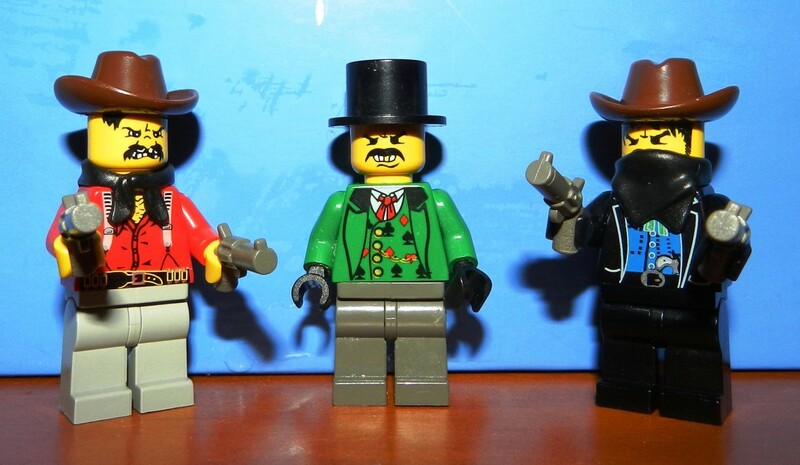 They were recurring characters in the Lego western theme in the mid-1990s and early 2000s, and could be found in sets like Sheriff's Lockup (6755), Bandit's Secret Hideout (6761) and Fort Legoredo (6762). There were a few different versions of each minifigure. You can see a couple of changes in the Lego minifigures of this period as compared to 15 years prior. Most obviously, the details had gotten much more intricate. Instead of the same smiley face for every character, different figures began to take on their own specific appearance. The second change is the presence of genuine bad guys. The Utopian world of the original Lego town finally has a few citizens worth arresting! Luckily there were still plenty of good guys around. 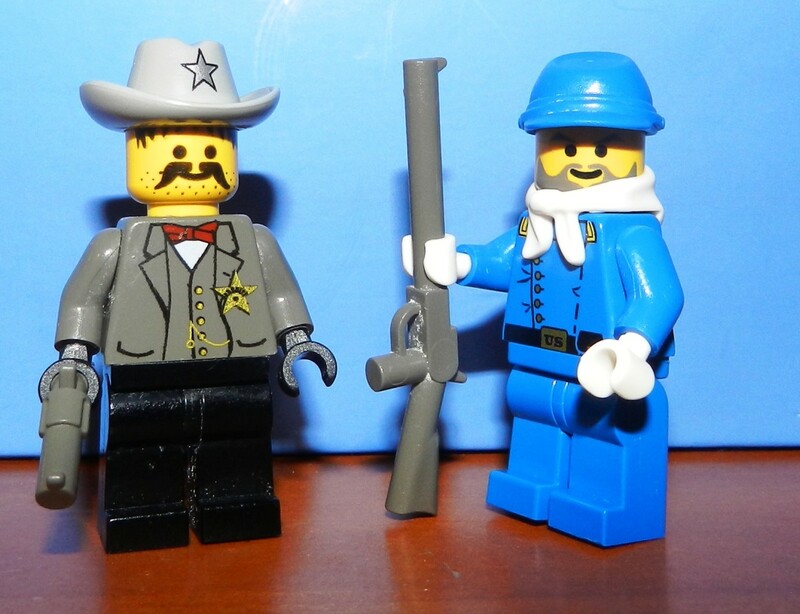 The Sheriff, too, was a recurring character in Lego western sets. There were several different versions of soldiers and Cavalry officers. 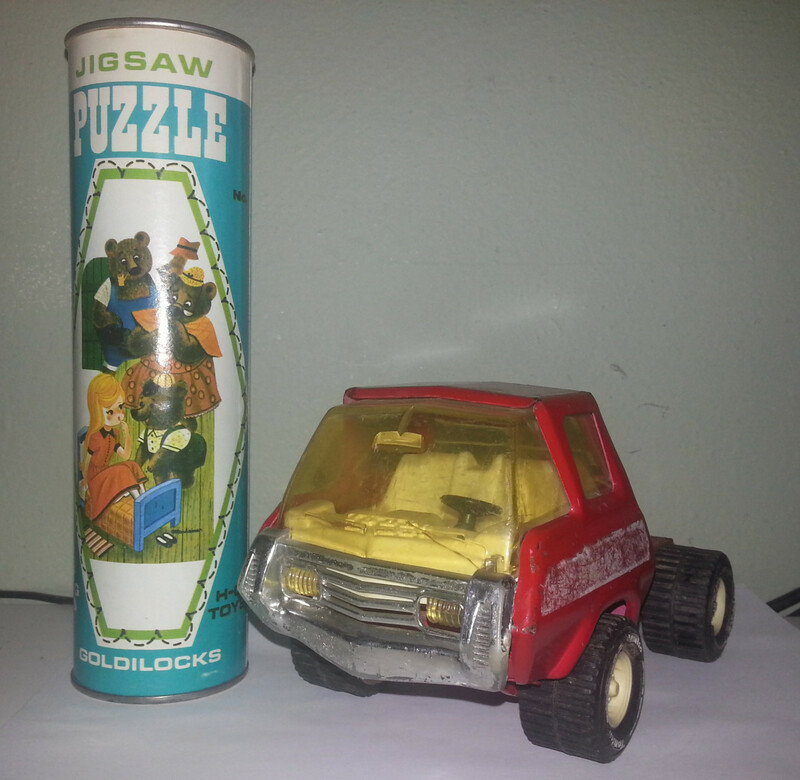 This one comes from a small set that was called Weapons Wagon (6716) which included a horse-pulled covered wagon towing a cannon. The cowboy theme might have been a little outdated by the time these sets came out, but it sure worked for Lego, and resulted in some of the coolest sets ever. The presence of recurring characters was also an interesting idea, but almost inevitable as Lego was increasingly moving away from the generic character profiles. The Pirate theme was another classic launched in the late-80s. This pirate with his loot and mischievous monkey named Spinoza was released in a small set simply called Buried Treasure (6234). The pirate theme first hit the shelves in 1989, but into the 1990s Lego would expand on the pirate concept with some truly epic sets. Along with the pirate minifigures came various adversaries and islanders they would encounter, and amazingly intricate ships and sets. The pirate theme originally ran until 1997, and was re-released in 2002. Legos have changed a lot in the past thirty-five years, and this is reflected in the minifigures. 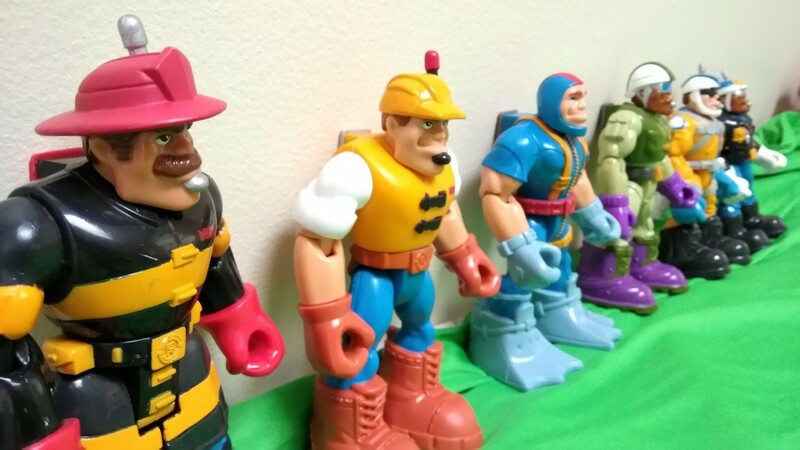 Decade by decade, they're an interesting part of toy history. Whether talking about the classic figures of the past, or the incredibly elaborate figures of today, they each have their unique story to tell. They're easy and inexpensive to collect too, and if you have a few already laying around the house you're off to a great start. Better still, if you can dig up those old Legos from your childhood you might find you have some gems hidden away in your collection. You can sell them for an unexpected profit, but like many of us you may prefer to keep them around as memories of days gone by. Whatever you decide, have fun with your Lego minifigures! 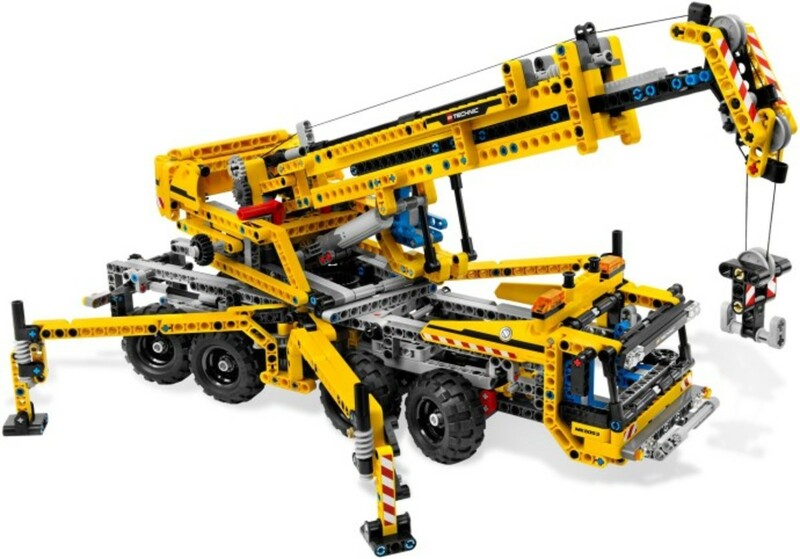 Lego Technic: All of the Large Technic Sets of the Last Decade! We've just been to LEGOLand Windsor and my daughter loved it. She was telling the staff there about all the stuff I'd given her from the early days. She even got her Photo taken with Mr Gold amongst others. What a great day out for LEGO lovers young and old. Thanks TreasuresBrenda! The ghost is one of my favorites too! Great page! I love the chef minifig and who doesn't love the ghost. I'm sure he was one of the favorites of my children. I know what you mean! I saw the movie for the first time last week and I still can't get that Everything is Awesome song out of my head! Lets build a spaceship! I can't help but think that when I see the space Lego after having seen the movie! Thanks MPG. Everything is indeed awesome! Hope you can get your Legos back without a fight. We gave all our Lego away to extended family members once our kids didn't use them any longer. I think we should ask for them back now. "Everything is awesome" isn't it Eric. Honestly this hub is better than the movie so it definitely deserves the HOTD. Congrats, voted up and awesome. Great hub about the LEGO minifigure. I enjoyed the history of the individual characters. @PlumbingOnTap: You can find some vintage sets and minifigures online at places like Amazon and eBay. You can also try yard sales and flea markets. There are parts missing but I've been able to find alternatives from new sets and even places that sell the bricks by the tub. Its just the likes of the Garage door I'm having trouble with. That's so cool, brutishspoon. I love those old sets! I have a lot of the pieces still but who knows if there are actually enough to build one of the old sets. 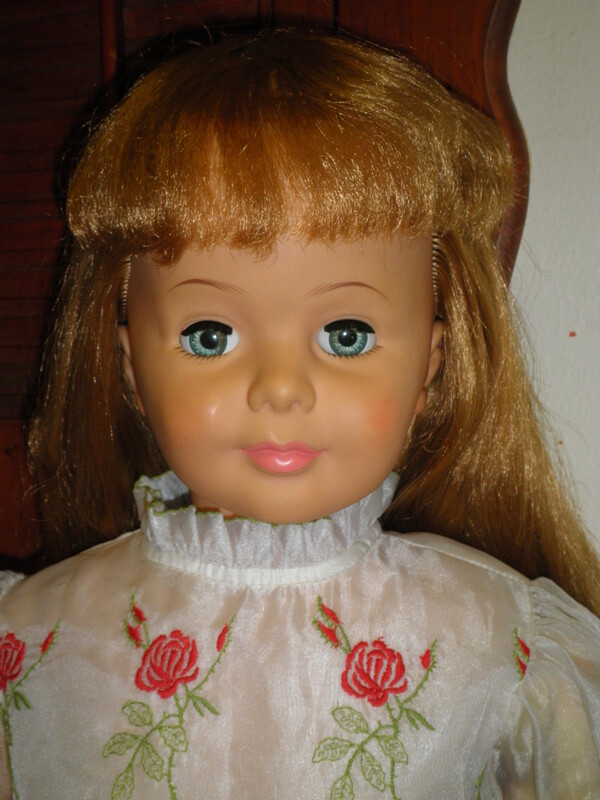 My daughter inherited what I still had of mine. Lots of Police and space Mini Figs, Road pieces and a grass board. She can make the Police Station from the late 80's/early 90's, I just need to get replacement parts for the rolling garage door. She can also make the stable from that time. Thanks Stephanie. My collection was kicked off when I found my old Legos when I was cleaning out a shed at my mom's house. The minifigures were still there, mostly. Glad she didn't toss them out over the years! Just a warning, glassvisage: If you go back and look for your old Legos you might get bitten by the bug and start collecting again. Not that there's anything wrong with that! :-) Thanks for your kind comment! I had all but the Doctor, Sheriff and Soldier... This makes me want to go back and see if I can find them all. The glow-in-the dark ghost was my favorite :) Thanks for sharing! Thanks ajorod17! Hope this Hub brought back some good memories! @Danette: Legos can be addicting, for kids and for adults! Love the Star Wars minifigures too! My kids loved Legos and we probably invested thousands of dollars in them! 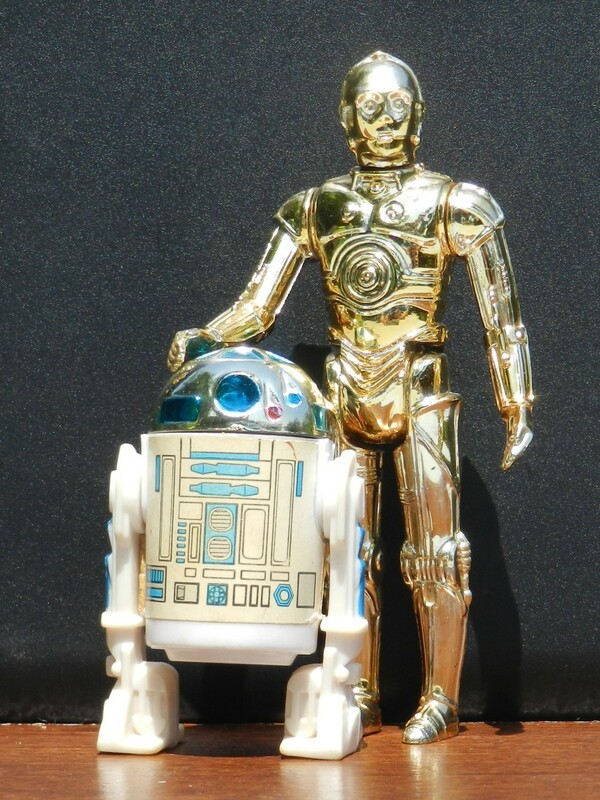 In fact, I have about 5 Star Wars figures that I've been trying to sell. All the parts are there, just don't have the original box. I think they've gotten too much into the "sets" rather than just buckets of bricks and various random figures to spark a child's imagination. Thanks everyone for all the great comments yesterday. It was a big honor to have this little hub named HOD! Nicely done Eric, very informative and nice flow to your hub. Upvoted/useful/following. Congrats on HOTD! Peace. Kawi. I still have some of those cowboy Lego mini figures. I remember getting a big fort set when I was young and playing with it for hours. Unique hub idea. My son ( 7 years old) just received a lego prize at school and this hub remind me about early years and funny things so thanks for this hub and nice pics. I have quite a few of these legos. I also have the original lego figures...just the head and arms, which are very rare. Long Live Legos! 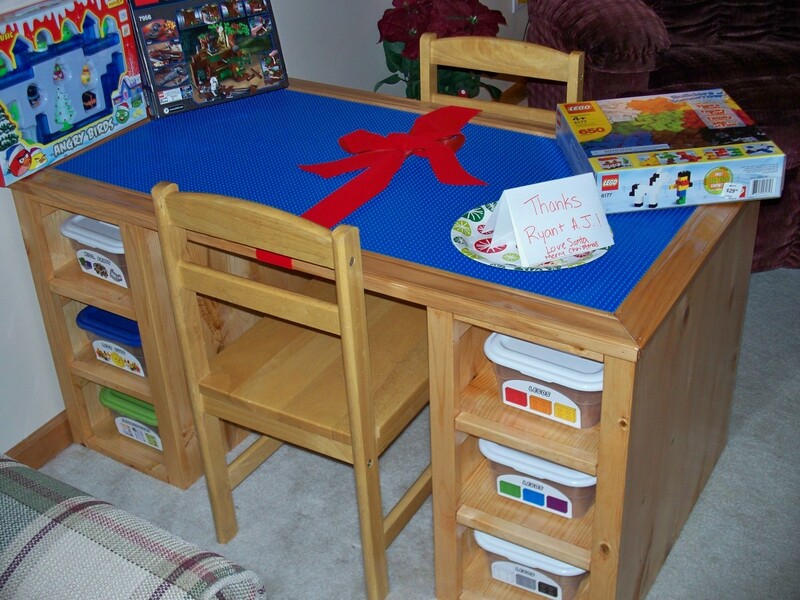 This brings back memory's had loads of Lego as child and my kids know have loads of it as well,and my sons birthday is 3rd June and i know his nanny is getting him some more, great hub. Thanks rebekahELLE! Hope you get a chance to visit Legoland! Love it! My sons grew up playing with legos and we still have some of the sets with the minifigures. I took a set to school for my older kids and they love working with them. They're excellent for developing fine motor skills and allowing for creative play. We're not too far from Legoland. I've heard it's lots of fun and colorful! You've done a great job with this topic and it's nice to see it as HOTD! Thanks for the kind comments, everyone. I'm very surprised by this Hub of the Day thing! Man, I love Legos! I still don't like the 'new' faces with the different expressions. The old ones with just different facial hair were way better! Eric, this is such an awesome post. I love LEGO's. They are one of my favorite toys to play with. The ghost minifigure is so cute. Congratulations on HOTD, Cheers! Thanks Marcy! I have great memories of Lego as a kid too. It's really amazing how these little minifigures have changed. This is such a cool hub, and so fun! 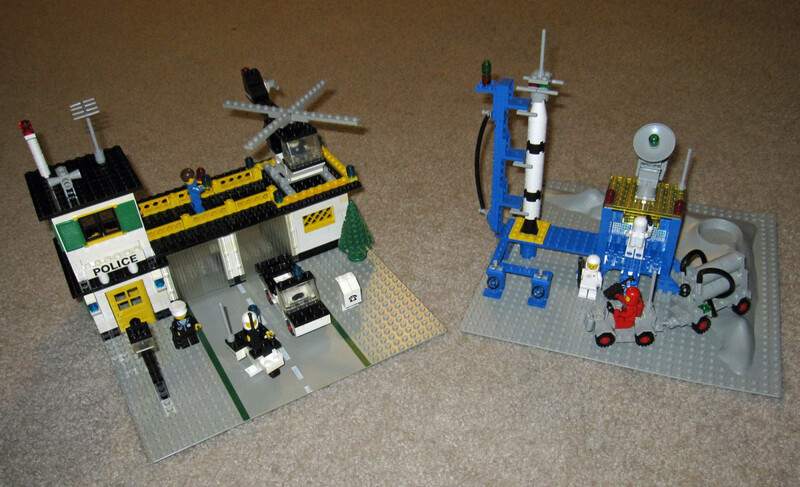 I grew up with the really classic Legos, and we had to design everything ourselves (I sort of miss those days!). A friend of mine recently bought several classic and rare sets for her toddler granddaughter's Christmas gift, and several of us all got to 'play' with them a week or so before Santa came. Voted up! Thanks for the kind words, ytenoh and pinto2011. Glad I'm not the only one who loves the old Legos! Thanks for rekindling my memory associated with the classic Lego sets. Very nice hub. This hub just super amazed me. Good job, awesome images, and keep reminding us to hold on to that kid inside ourselves! Definitely sharing. Cool and fun hub. Voted up and awesome. Thanks Geekdom! They are pretty neat! Cool Hub! I love reading and writing about LEGOs. The minifigures have always been fun.